Luke Donald hits a tee shot at the Tampa Bay Championship on March 17, 2013. The world number three and past Major winners Padraig Harrington and Charl Schwartzel will look to fine-tune their games for the coming Masters during this week’s Maybank Malaysian Open. World No. 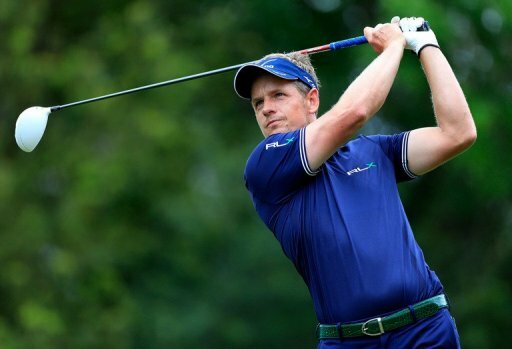 3 Luke Donald and past Major winners Padraig Harrington and Charl Schwartzel will look to fine-tune their games for the coming Masters during this week’s Maybank Malaysian Open. The trio head the field for the tournament starting Thursday at Kuala Lumpur Golf and Country Club, which has a prize purse of $2.75 million, along with rising young star Matteo Manassero of Italy, who won here in 2011. Great Britain’s Donald who was world No. 1 until Northern Ireland’s Rory McIlroy took over last year, is gunning for his eighth European Tour win in Kuala Lumpur. He also has five US PGA Tour wins under his belt. Donald is yet to win a major, however, and said Tuesday after his arrival in Malaysia that the silver lining in losing the world’s top rank is that it has allowed him to focus more on the April 11-14 Masters in the United States. 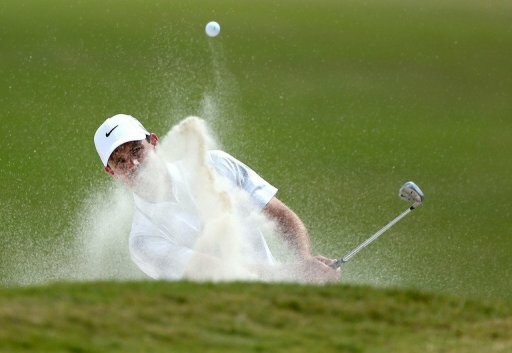 Charl Schwartzel plays a bunker shot at the WGC-Cadillac Championship on March 10, 2013. He is one of the favourites at this week’s Maybank Malaysian Open. “I am looking forward to (the Masters) and in recent weeks my game has come together well enough to give me confidence in doing well next month,” Donald said. But he will be focused more immediately on the challenge from tough competitors Harrington of Ireland, South Africa’s Schwartzel, current Asian Tour No. 1 Thaworn Wiratchant of Thailand — and jet lag from a flight from America. “The 12-hour time difference will be a bit of a challenge, but in the past I’ve always dealt with that pretty well,” Donald said. Harrington, a three-time Major champ, will tee off with “a bit of anxiety” using a new driver after his trusted one broke recently, as well as trying out eyeglasses. “I have a slight astigmatism which causes me to struggle to read the greens,” he said. Other Asian competitors will include Thaworn’s countryman Thongchai Jaidee, a former two-time Malaysian Open winner, and an in-form Gaganjeet Bhullar of India, the current leader of the Asian Tour’s Order of Merit. “It is a very important week. I need to win the tournament to give myself a chance at qualifying for the Masters,” Thongchai said. Donald said Asian golf was growing rapidly. “There are some great players from Asia, some great facilities and courses coming up. Really, the game of golf is expanding into this part of the world, and it’s nice to come over here and be part of that,” he said. The Malaysian Open is co-sanctioned by the Asian Tour and European Tour.